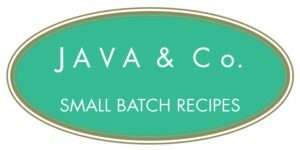 A love of coffee was the inspiration for a line of food products for Java & Co, an associate member of the Illinois Bed & Breakfast Association. After years in the hospitality and food business in New York City, the husband and wife owners of Java & Co moved to Illinois for a change of pace. It wasn’t long before they went back to their foodie roots, and in 2008 started a company making coffee-infused syrups. Their first product, a tiramisu syrup, was something they had been making for friends for years. Today it’s one of seven syrup offerings that include flavors such as French Vanilla, Java Nut (hazelnut), and a seasonal Jamocha. All the syrups are created in small batches using only Fair Trade arabica coffee beans, and contain no additives, preservatives, or corn syrup. They’re deliciously versatile, and can be served on pancakes, over fruits and desserts, added to meat sauces, or used in other creative ways. You’ll find more recipe ideas on the Java & Co website. In addition to syrups, Java & Company has branched out into making a range of sweet and savory products—pancake mix, biscotti, espresso sea salts, buttery caramels, and more. 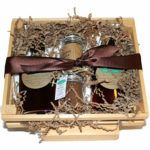 If you’re seeking something special for the coffee lover on your list, check out the company’s gourmet gift sets, such as the Artisan Foodie Gift Package (shown) featuring syrups, dry rub, and espresso powder. Java & Company offers free shipping on orders of $75 or more—a nice incentive for not only innkeepers but holiday shoppers too! Photos courtesy of Java & Co. This entry was posted in Food and wine, Illinois Bed and Breakfasts and tagged Illinois Bed & Breakfasts, Illinois product by admin. Bookmark the permalink.